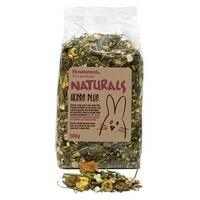 Rosewood Naturals Herbs Plus is a tasty and exciting addition to your pet's well-balanced diet. This herbal sensation offers smaller animals with an expertly balanced mix of herbs to provide essential vitamins and minerals. Combined with wholesome grains and healthy vegetables, this delicious blend of parsley, peppermint, red clover and other herbs is simply irresistible to both rabbits and guinea pigs. Our rabbit loves this, He has a small bowlful in the morning and tucks in every day. The quality is always very good and VetUK charge a very reasonable price compared with other retailers.